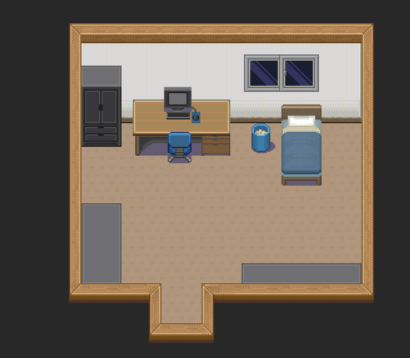 This has got to be at least the fifth time I've had in idea for an RPG Maker game and started working on it. However, this time, I feel like I have enough ideas to make a complete game, and hopefully I won't run out of steam. Like most of my previous game ideas, this game will be a horror game (although the horror aspects of the game haven't yet been fully fleshed out). I have a basic idea for the storyline, as well as a few maps. I'm glad I you asked. So far, I haven't really found a way to describe it without making it sound like a cross between To the Moon and Yume Nikki. A little bit of background info first: As you might know if you read my overly sentimental essay of a post from a few months ago, I graduated from college recently. (ugh, is this guy still talking about that?) Since then, I have had a lot of time to reflect on my four years in college. One recurring thought is that I could (and should) have done a few things differently. There are some things I regret not doing, and things might have played out differently (for the better) had I done things differently. However, at the same time, I have felt extreme nostalgia for my time there (even though it was recent), and wish I could relive some of that time, even though it (for the most part) didn't seem to great at the time. A couple months ago, I started having some weird dreams for about a week. In these dreams, I was back in college, and while I've forgotten most of the details, in these dreams I had done something I hadn't really one in real life: I made the most of my experiences. For instance, in one dream, I had a much easier time socializing, and in another dream, I made the most of my final days on campus, revisiting all the campus spots where I had formed memories over the past four years (This was something I had been planning on doing in real life, but never got around to doing). As it stands, the premise of the game is just that: The player character is a guy in his early 20's, fresh out of college and facing an uncertain future. He is haunted by his dreams, which taunt him with the idea of what could have been. The funny thing about dreams is that everything that happens seems real, and you don't question the absurdity or surrealness (is that a word?) of what's going on. It's hard to explain the exact nature of the main character's experiences in these dreams (largely because I haven't really decided what happens yet), but each dream will involve an idealized representation of what could have happened, and/or some form of representation of how things didn't go as well as they could have (the two are, in my mind, inherently tied together, and the latter will probably be represented by horror elements). Study Abroad - As some of you might remember, I spent a month abroad in China and Japan at the beginning of 2016. This was, far and away, easily the best part of my time in college, and I get intense nostalgia for that trip to this day, and the prospect of going back there is one of the biggest motivating factors in my life. I hope to incorporate this, though I'm not sure whether to set it in Shanghai and/or Tokyo, or some ambiguous amalgamation of the two, a "generic East Asian city". Fields - My college campus was located in a rural area, and had a rather large park-like college-owned area adjacent to the campus. This was mostly a large field, with a few paths running through it, and had a few large ponds and a small forest. I liked walking through it by myself, listening to music and thinking about whatever had been on my mind lately. I can't say what it is (at least yet), but I do have an idea for a rather big story point which occurs in this dream. Okay, anyway, enough rambling, now to show you guys some of the maps I've made! As I said before, I'm still in the super-early stages of development, and have only made a couple of (pretty simple) maps (none of which are really "done"). However, I'm still excited to show you guys these maps, no matter how crude they may be. As I said above, the library is based on the actual library where I went to college, and the reference room is no exception. 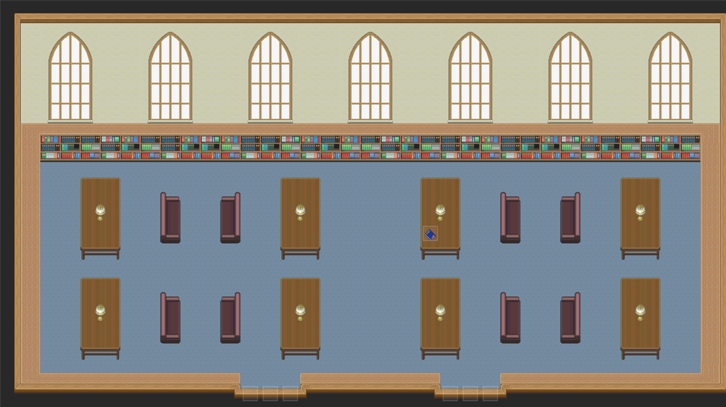 I've actually had the idea to set a game in this library for a few years, and I started attempting to recreate the reference room in RMXP a little over 3 years ago. As such, most of the edits that I made to the tilesets used in this map were made back then, and I believe that some of them were made in the room itself! This particular map, however, was made about a month ago, and in my basement . I hope to add paintings on the walls, and have a more diverse selection of books, as opposed to the same six or so tiles. So... yeah. That's pretty much the game so far. It's obviously got a looooong way to go, but I feel like I can go quite a long way with this idea. I don't have a title yet (not even a working title), but I'll change the thread's title once I come up with a good one. I know this post is really long, thank you for reading this, and I promise the devlogs from here on out will be much, much shorter. Let me know what you guys think, or if you have any questions about anything related to the game. RPG Maker game you say? That sounds stupid. Jesting aside, I'm guessing this "untrue" ending involves something along the lines of a Yume Nikki ending, yes? At the moment, I don't have any ending along those lines planned (largely since I don't think I can effectively implement anything like that), but then again, plans do change.